Stephe Thomas’ email-based “Mais n’est-ce pas la gare”. I use ps18xx heavily and don’t use any of the others. I’ve also setup games under a webcam and played via a Google Hangout, which worked fairly well. 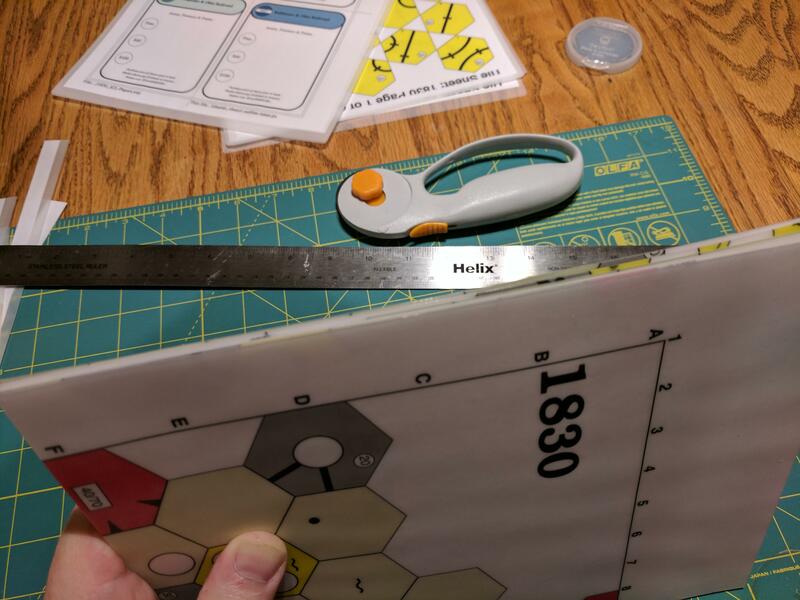 Stephe Thomas correctly noted that ps18xx needs a few additional tweaks in order to be smoothly used as per Founding Platforms, most notably to support alternative paper sizes (I think I used A1 for the 1830 map? Might have been A2 – play with it) and to adjust the layout for track tiles to fit correctly on US Letter paper. I’ve made a GitHub repository with the requisite changes and sent them to Stephe Thomas as well. Homefully the changes will make it into his master. 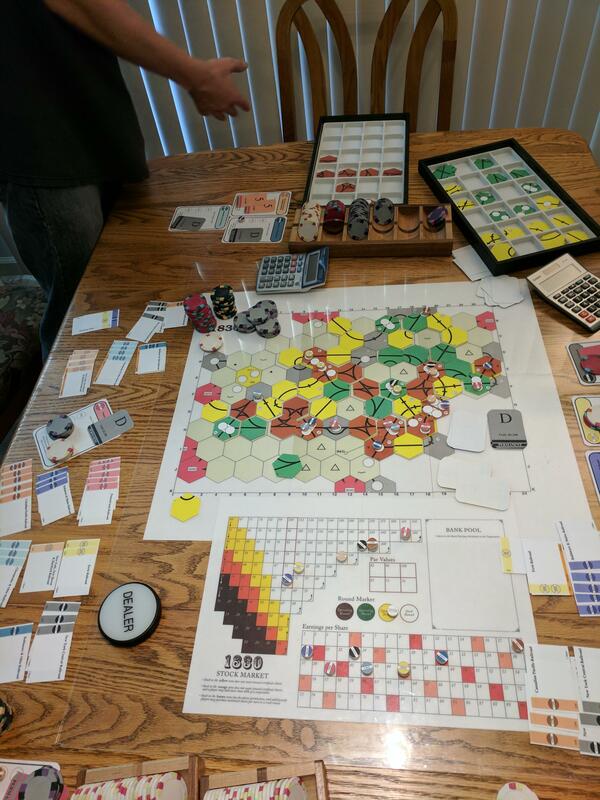 Last weekend I made a highly functional copy of 18301 from scratch (ie from blank paper to a finished and fully playable game) in less than 7 hours. This is how I did it. Manufacturing a game is a purely mechanical and highly repetitive process. Recognise this. Optimise your body positions and your physical processes to make that efficient. Time and motion study is well worth your investment. I’m right-handed, so my left hand and arm are clumsier and less accurate then my right. As such I optimise my workspace such that my left hand is mostly doing crude/bulk actions and my right hand is doing high-control/detailed actions. This may sound like a trivial detail, but in a test I did a few years ago that optimisation alone saved almost an hour and a half from a larger game build! 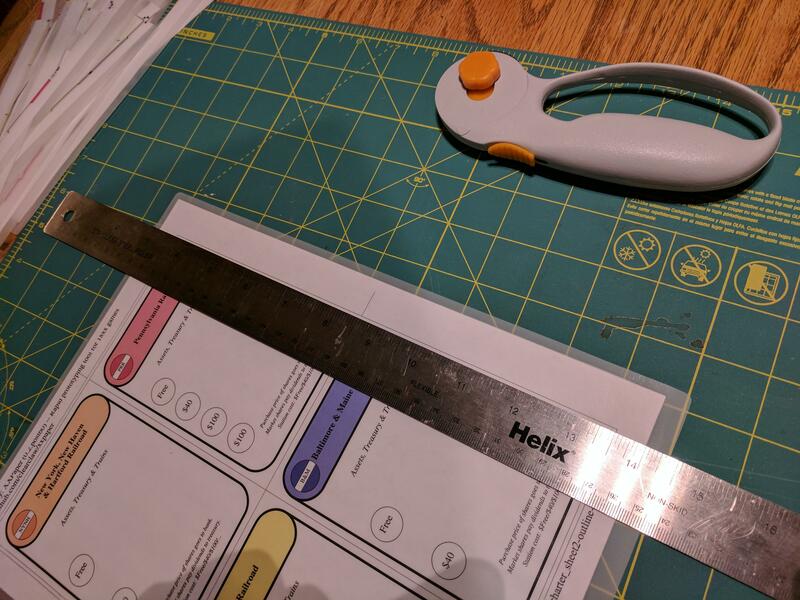 I’ve also noticed that I make more accurate and more controlled cuts with a rolling knife if I’m cutting slightly to the right of my center line and am cutting from the lower right up and to the left. This one is both a time saver and more importantly, an error-rate improver. 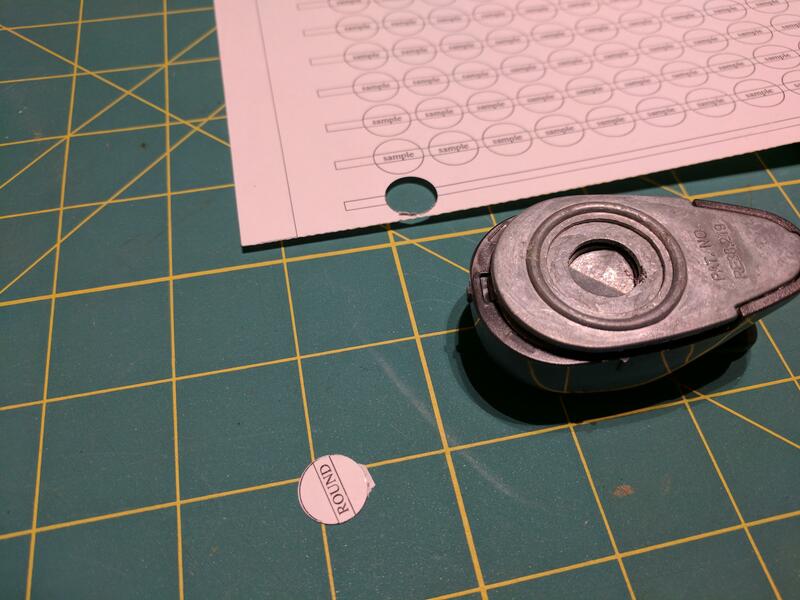 I get the tools positioned more accurately more quickly, I make fewer bad cuts and thus fewer reprints and re-dos for critical errors. There’s a significant accuracy and efficiency gain from doing only one thing at a time. As such, if I’m laminating, I do all of the lamination before moving on. 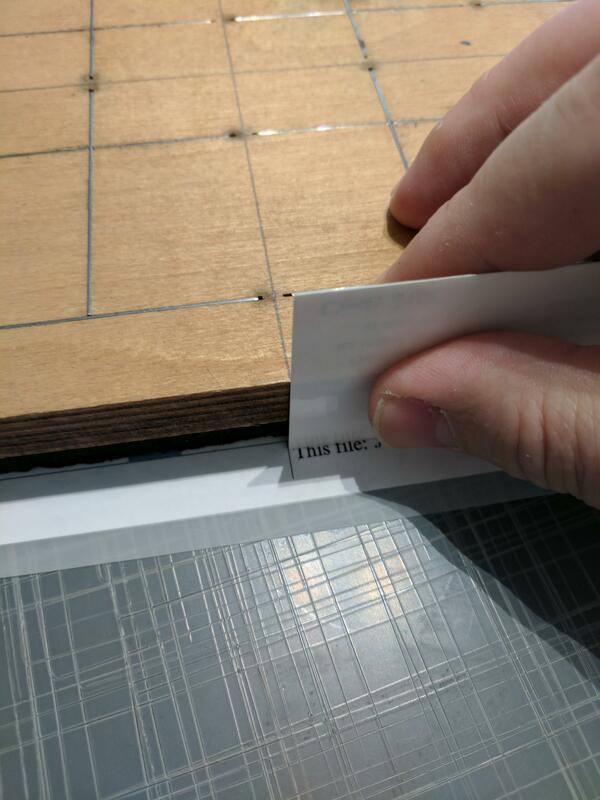 If I’m trimming the outsides of pages, I trim all the outsides of the pages before moving on to cutting out the individual components, etc. The idea is to isolate a specific action and body motion, to optimise and practice that and to then do nothing else but that single thing until it is all done everywhere. The result is more accurate cuts made faster and thus fewer critical errors that need re-dos. Objects to be processed are to the upper left. Trimmings and scrap are to the immediate left. 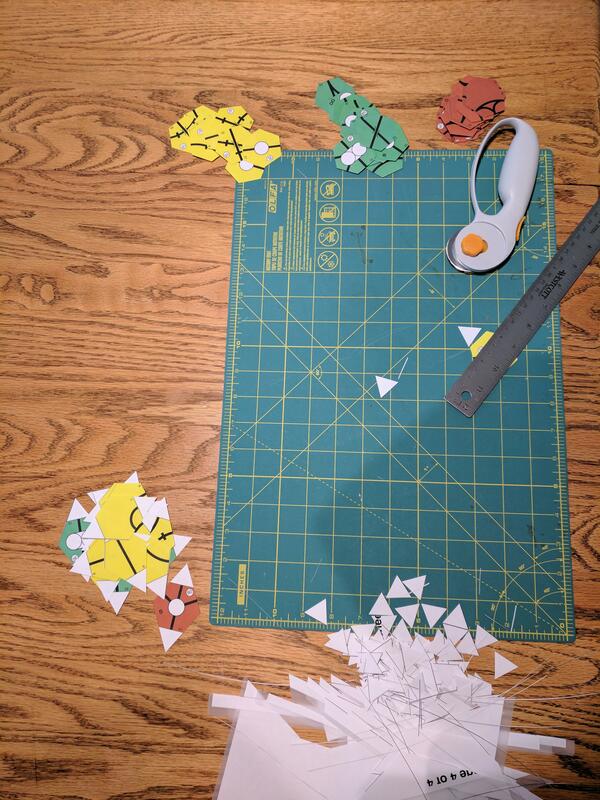 The work area is immediately in front of me (the long side of the cutting mat in most of the below pictures). Finished items are either to the immediate right or upper right. My left hand gets the next piece to work on from the upper left and brings it down and into the work area, slightly to my right. Along with my right hand, the piece and rule is accurately positioned so that the cut goes from the lower right up and to the left. The cut is made: left hand holding the rule, right hand moving the knife. If the cut requires multiple passes (generally one pass for 3mil, 2-3 passes for 5mil and 3-4 passes for 10mil), then for each pass the knife is returned to the lower right and makes the exact same cut again. I don’t roll the knife back and forth in both directions as I’ve found that encourages the knife to wander and make sloppy cuts. My right hand sweeps the cut item to the right. My left hand sweeps the trimmings to the left and then moves up to get the next piece. 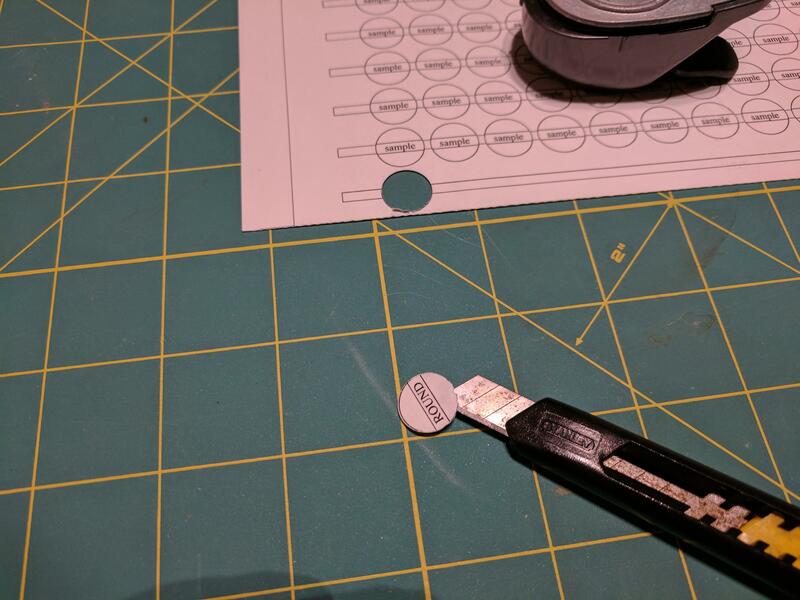 For all the arguments about the above being boring or unnecessary or overly pretentious and picky or dear-gods-give-it-a-rest I can point to saved time, a more accurate product and fewer mistakes requiring me to re-make a component from scratch. The metrics win. If you’re going to emulate a machine, ensure that you’re emulating a very efficient machine. First, a note on vendors. I’m going to use Amazon links almost as they’re effectively universal. However my recommendation is not for Amazon per se but is for that specific equipment, model and material manufacturer. 10mil matte lamination pouches . Whole page label for the token stickers. 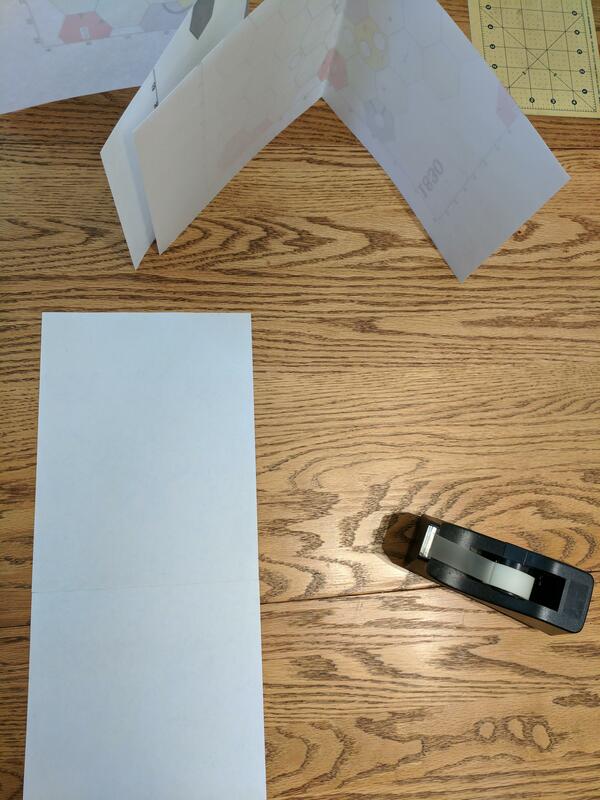 Just standard cheap printer paper. Really. Nothing special. Note that the lamination pouches are matte. While glossy lamination is significantly cheaper, it is markedly less pleasant to play with. That said, satin is even better than matte, but also rather more expensive again. I don’t find the cost differential justified. The 5mil lamination is for the track tiles. Well, almost. At the time of this build I’d run out of 5mil and hadn’t noticed. Ooops. 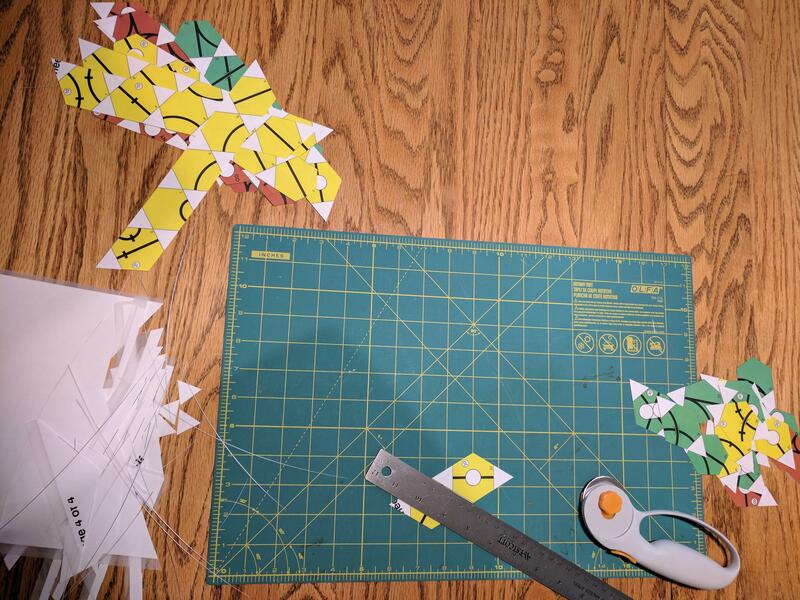 So for this project I made the track tiles using 3mil…which really isn’t ideal. They’ll be made again, properly, later. Track tiles made with standard printer paper and 3mil lamination are a bit too thin and a bit too flexible. 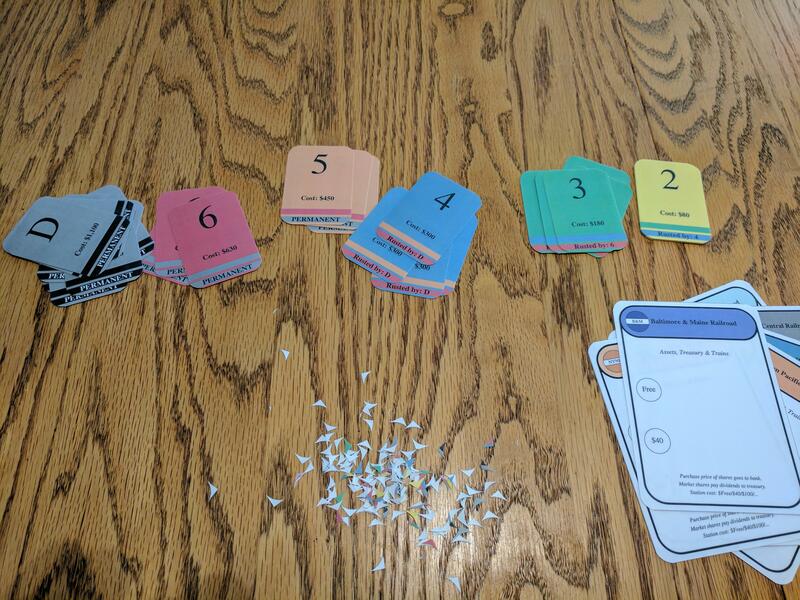 They tend to stick together together a bit, are harder to pick up from the board and harder to sort and separate in the hand. This isn’t a Huge Deal, they are playable, but it makes a noticeable difference. 5mil laminated track tiles using the same paper etc handle noticeably more nicely. Everything else, privates, shares, and trains was printed on standard printer paper and laminated with 3mil…and that’s just fine. Well, kinda okay. Be careful with the choice of label paper. I’vee found that Avery don’t stick nearly as well as some cheaper brands, epecially the one I linked above. HP Laserjet Pro Color m252dw. I have several steel rules, but you only really need one. Asides from the rubber/cork backing (pretty standard), I recommend getting a stiffer rule (thicker metal) rather than one of the floppier/more flexible varieties. The shorter stiffer rules are easier to control and position accurately with one hand. I think the one I linked above matches this description but I haven’t tried that specific make/model. Similarly, I don’t know the specific thin-bladed knife I linked above but that one appears similar to the one I use. The corner rounder I used is cheap junk and is not recommended. 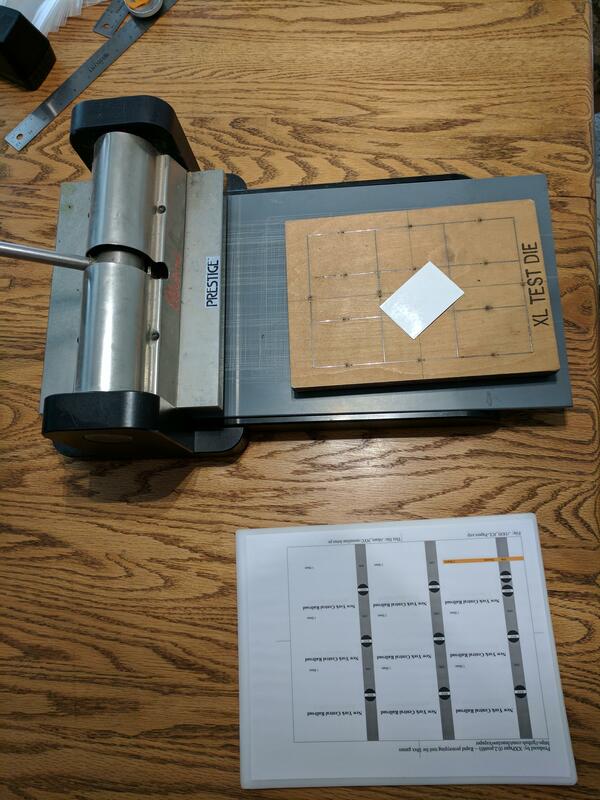 It works, but only barely and only for thinner stock and thinner lamination (a bit iffy with 3mil and even more iffy with 5 mil). 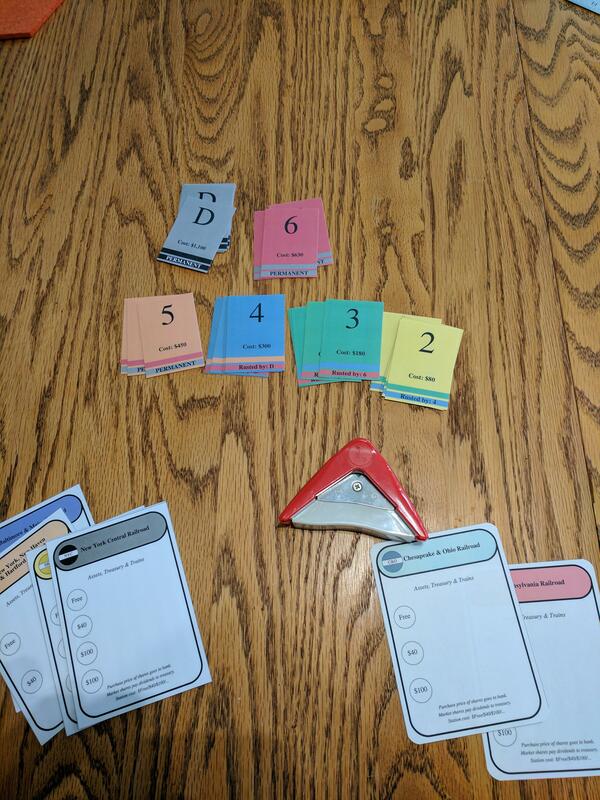 Oregon Laminations corner rounder is however recommended…but I hadn’t received it by the time of making the game. 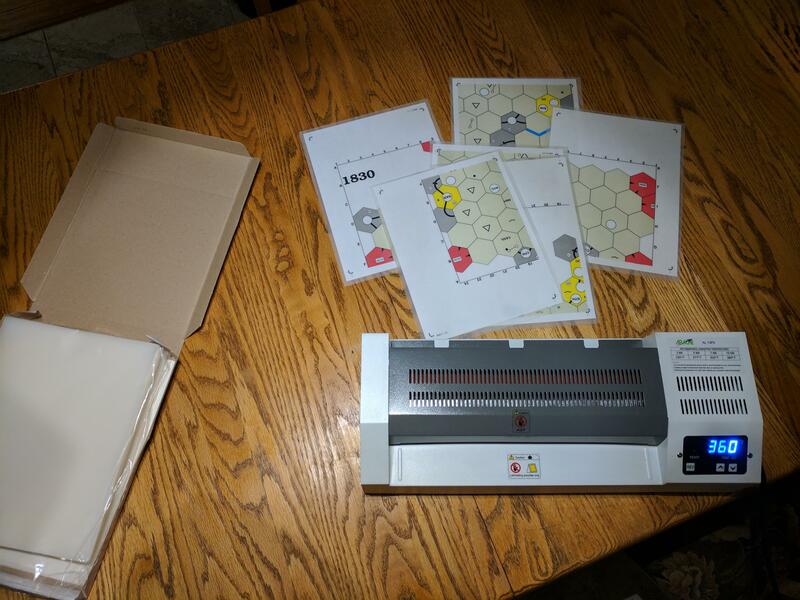 The Apache AL13P2 laminator I use is big, heavy, built like a tank, heats slowly, cools even more slowly, and the outside gets hot enough to burn. But…it has four rollers and can be heated past 360 degrees Fahrenheit…and that’s useful. Cheap consumer-grade laminators generally only have two rollers and ~no temperature control. At worst this means laminated material comes out cloudy and whitish due to the lamination not getting hot enough to properly melt and not getting enough pressure to be fully pushed into the fibers of the paper. Now this mostly doesn’t matter with 3mil lamination, most any laminator can handle that, but it comes into play with the thicker stuff. 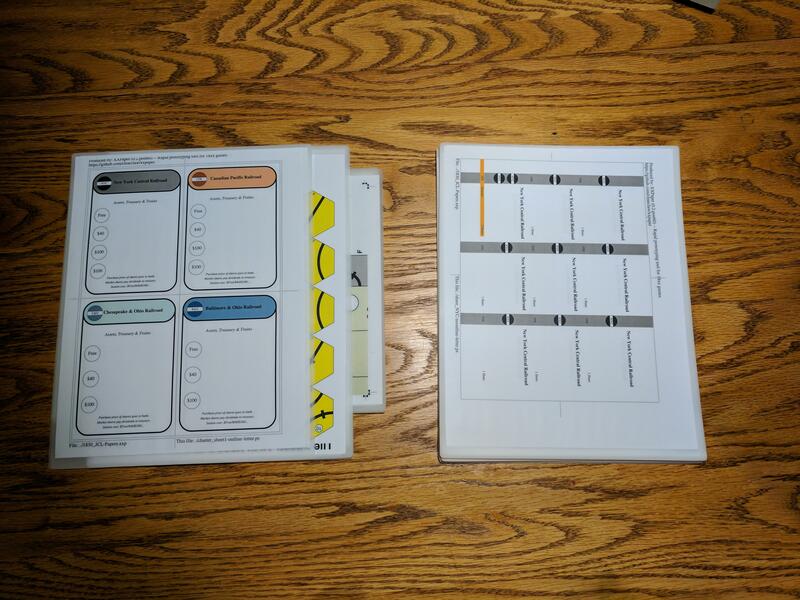 Even the $17 Amazon Basics Laminator can mostly handle 3mil lamination. Mostly. Given enough passes running the material through again and again it even tries (and half-fails) to handle 5mil using Oregon Laminations 5mil matte pouches: The pages still comes out cloudy and whitish. I mostly-happily used a Fellowes 5600 (think that was the model number) for most of a decade until it died earlier this year. It did great on 3mil and with a couple passes even did well on 5mil. Maybe it would have worked with 3-5 passes on 7mil? I don’t know. But it completely failed on 10mil. When it died I replaced it with the Apache AL13P2 mentioned above. That laminator handles 3mil, 5mil and 10mil with only a single pass, just like a dream4. Note: Oregon Laminations appears to recommend the TruLam TL-320B – which appears identical to the Apache AL13P2 laminator. Possibly one is the OEM? I also used an Ellison Prestige Pro die cutter for the privates, shares and trains. 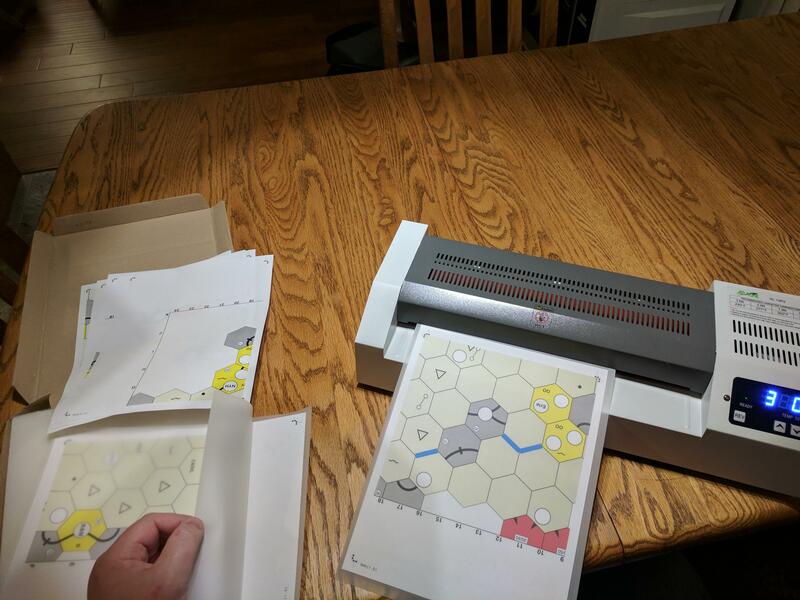 (Note that it is $600+ on Amazon and ~$400 direct from the manufacturer It is a fairly expensive bit of kit, and even more so when you add in custom-made dies2 for cutting track tiles. The Ellison Prestige Pro is the same equipment that Deep Thought Games, Golden Spike Games and All-Aboard Games all use (and I think Marflow Games as well). For this build I used the die cutter, along with the test die that it came with solely for the privates, shares and trains. I wrote XXPaper to produce private, share and train art that precisely fits the test die. 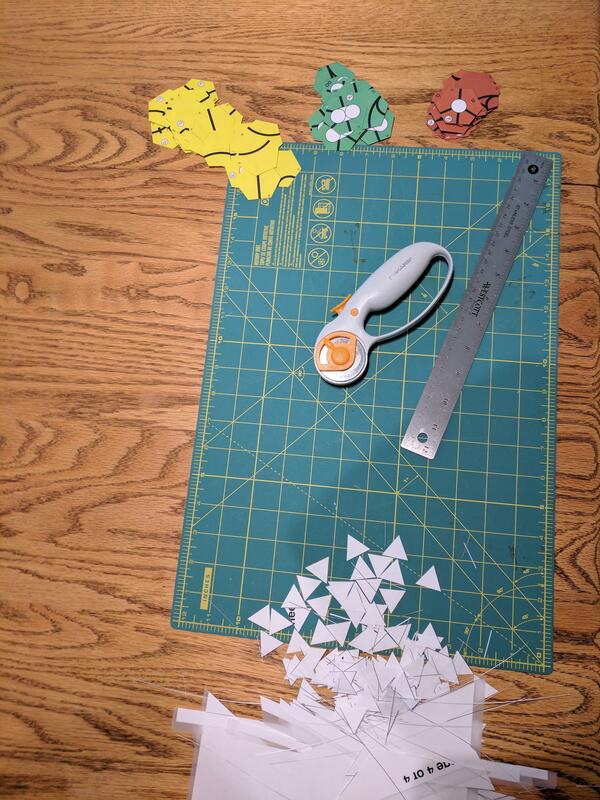 While the die cutter certainly saves time, it really isn’t necessary unless you are making a lot of games. Trimming the privates, shares and trains by hand would have added perhaps half an hour to the build. 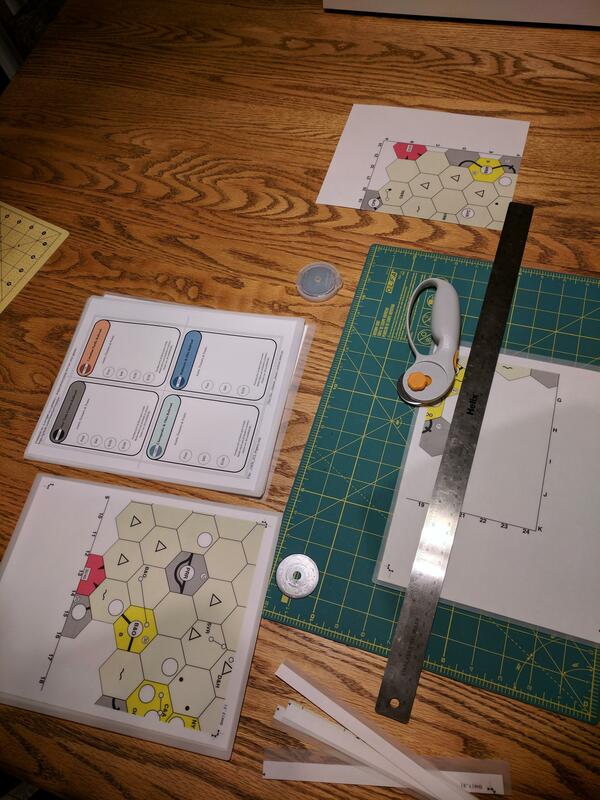 First, make and print the map and tile sheets. ps18xx5 can trivially generate the map…but it does so at a reduced scale (small enough that the entire map fits on a single page). The trick is to get it to make the map properly bigger and then to paginate the result across multiple pages cleanly. Scale the map hexes up to be normal size. Move the resulting image on the page so that it needed fewer printed pages to cover all the important bits (ie not the white space) and the printed segments more sensibly divided up the map space. The key line there is the mapScale line. We need bigger hexes…and some measuring and calculation gives the desired scale bring around 1.20 rather than 0.6.6. Note: The lines starting with percent signs (%) are comments and thus can be and are ignored. And there you go, a nice map nicely positioned as a raw Postscript file7. 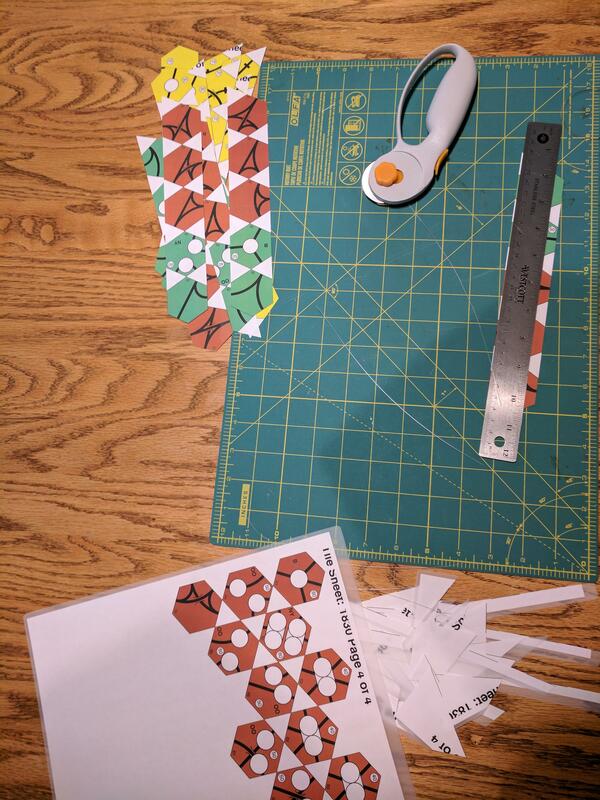 Now to get it properly paginated for printing and cutting. Most Linux systems come with a tool called poster to do this sort of thing. Certainly there are other similar tools available for other systems. In short, I manually defined the page size of the original file, scaled it by a factor of 1.0 (ie not at all) and paginated it across letter sized pages. If you live in a sensible and civilised part of the world with an actually rational measuring system, use A4 instead. Note: I fiddled with the above line, trial and error, also adjusting the translate line in 30-map.ps and the exact size of the page I passed to poster until I got what I wanted. It was fiddly but didn’t take long before I got a good result.. 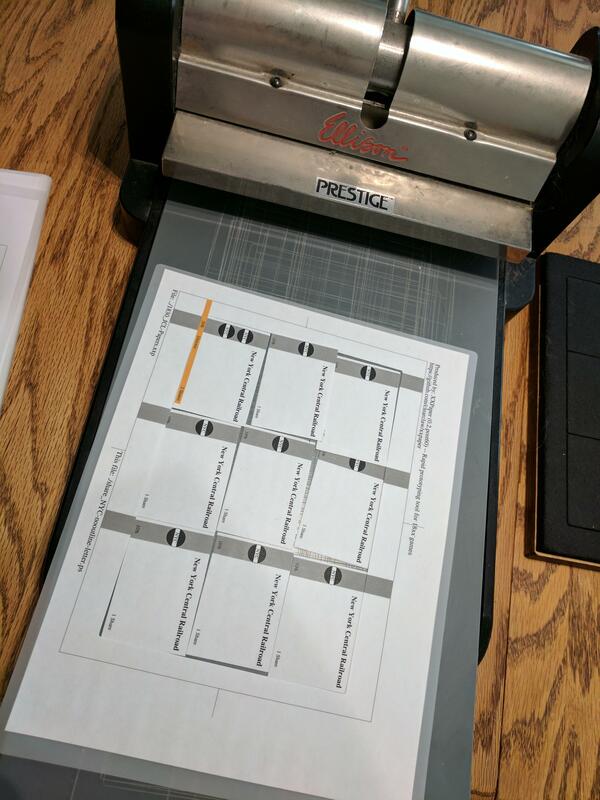 This will print the map in segments, with clearly marked cut lines. All that’s required from there is laminating and then precisely trimming to those cut-lines. A not entirely different process, but with a lot more fiddling, got Peter Mumford’s stock market similarly scaled and printed. I don’t yet have a good tool-chain built for automatically generating larger 2D stock markets, so for this build I’m stealing, err, Peter’s slightly buggy file (it has a minor error). 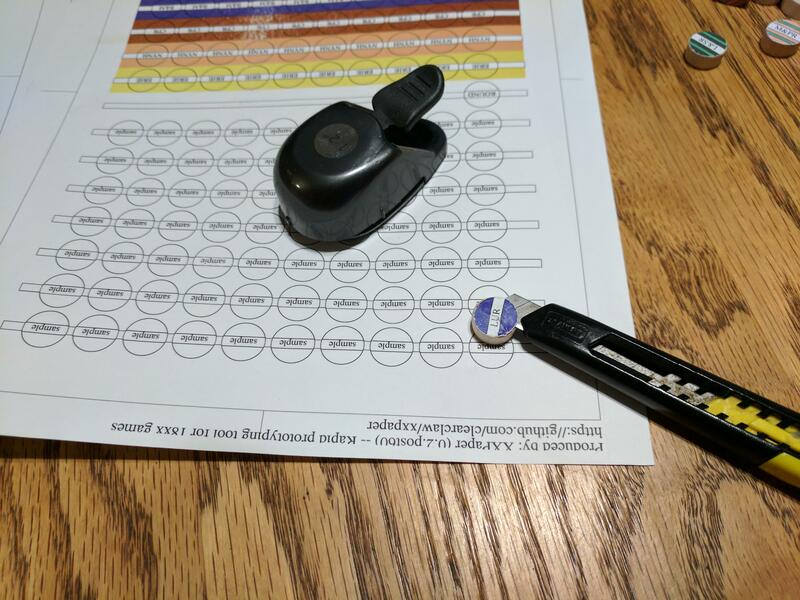 Take each page, slip it into a pouch of the appropriate thickness, center it and run it through the laminator. Adjust the temperature of the laminator appropriately for each type of pouch (in general this means flipping a little 3mil/5mil switch but for the laminator I used it means dialing in the target temperature directly). Here’s the map all done in 10mil. Look closely and you can see the cut lines (little back triangles) showing where to cut for the map segments to align precisely. First, start with a new blade in your knife. I use a new blade for every game, two for larger games. The extra ease and precision is worth it (blades are cheap). 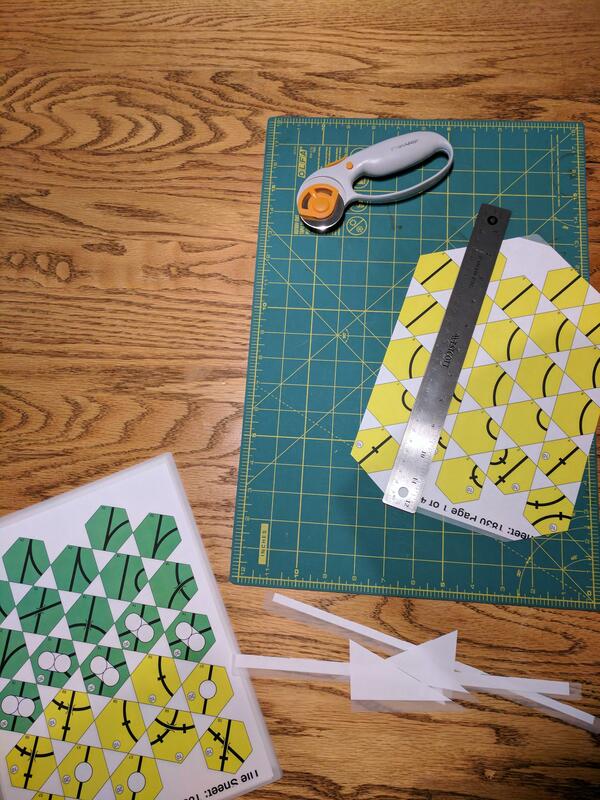 Also remember that I’m sitting to the long side of the cutting mat in the below pictures. New stock is to my top left, waste to the lower left, cut material to the right. 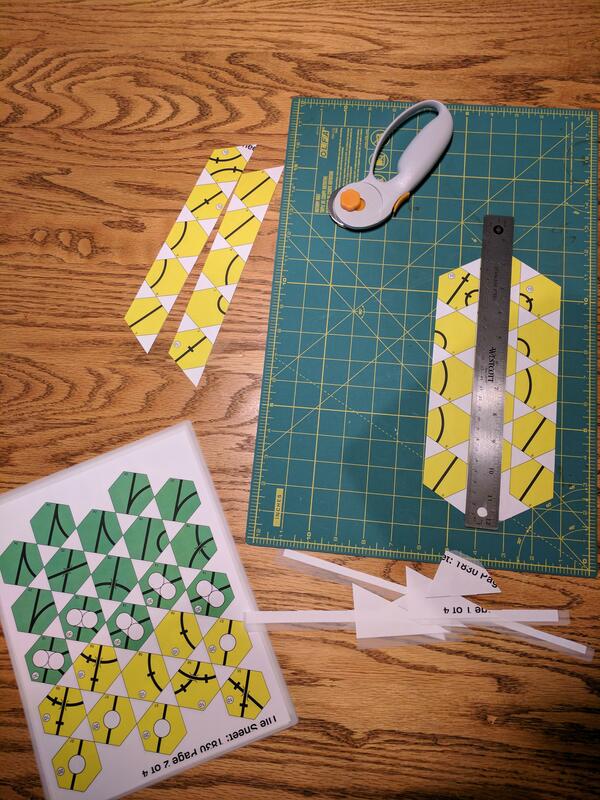 The map segments have cut markers showing precisely where to cut to get the segments to line up perfectly. The problem is that once you cut to one marker, you’ve also cut off the other marker on that side – and precision is particularly important in getting the map segments to line up exactly. My trick was to make the cut along one side all the way through but not for the full length. I didn’t cut all the way to the end and left the extra bit still connected at the end. Thus the strip dangled and was attached only at the end…and was perfectly aligned with the remaining map. Then I made the next cut in the other direction, cutting off the loose end of the dangling strip while creating a new partial cut. Lather rinse repeat around the outside and you get a perfectly cut map segment! And now for the big monster, the track tiles! Following the rule of picking a single action and doing it everywhere before moving onto the next action, the first step is to trim the outside of the tile sheets. A secondary goal in this process: whenever possible make cuts that affect multiple track tiles. Doing so reduces the total number of cuts needed, thus also reducing possible errors. And all done in 1 hour and 10 minutes! I originally stuck the segments together in pairs. Since then I’ve decided that was a poor(er) choice and instead to make a 6-panel folding map. This will mean that some of the cello tape is on the top/visible surface of the map, but as I’m using a slightly whitish tape, something close to a “magic tape”,” and it just disappears once it is on the map. The stock market was made just like the map, but only had two panels. Ahh, the Ellison Prestige Pro die cutter! There it is in all its glory along with a test due and an old extra private I’ve previously cut with it. 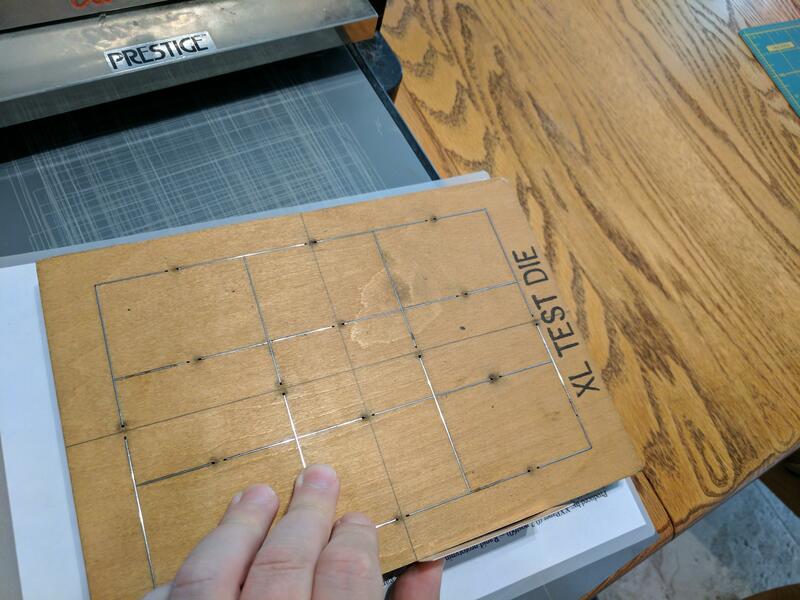 I use an old spare private or share I cut earlier to ensure that the alignment lines that XXPaper made on the art-file lines up perfectly with the registration lines I drew on the die. As you may imagine, this can be a bit fiddly8]. And voila, a cut sheet of shares! All that’s done, all the privates, shares and trains, and now to round the corners of the charters and trains. I only round the corners of charters and trains, nothing else. I could do the privates and shares too, but I find that square corners on the shares make it easier for players to display their portfolios neatly (okay, I find it easier). And as for privates? Some privates contain a lot of information and the corners can get a bit crowded. XXPaper‘s format is still generous enough to allow the corners to be rounded, but not by much and privates aren’t handled much, so I leave them square. I used to use wood plugs manufactured by General Tools as sold by Home Depot (the small box to the left). They work well. 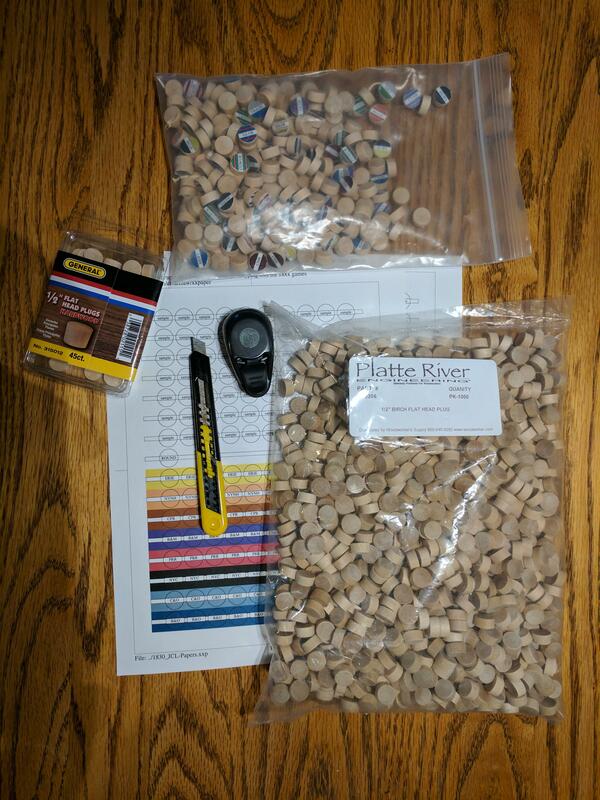 But Home Depot is out of my way and General Tools no longer sells direct…and I’ve found that Platte River sells bags of 1,000 even more cheaply on Amazon. 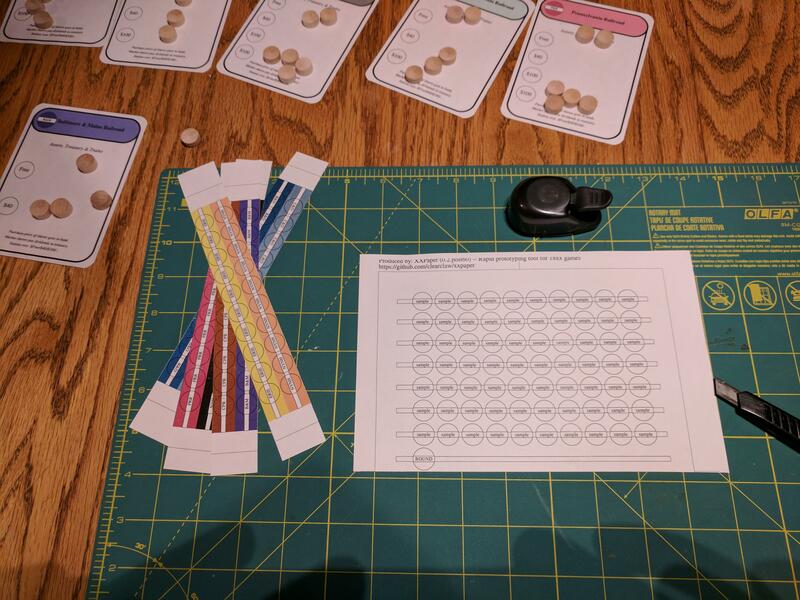 If you’re only making a few games I recommend the General Tools product. 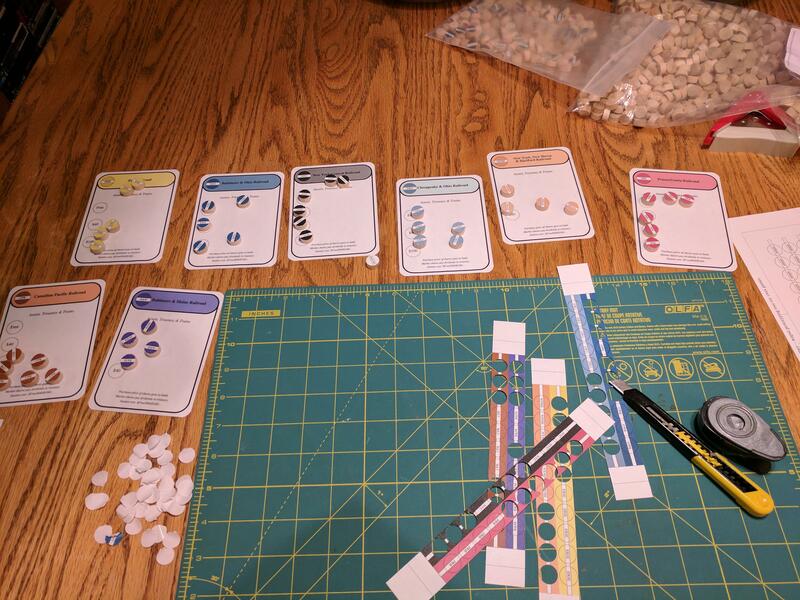 But for this game I’m going to use tokens from old prototypes from the bag at the top of the picture. I’ll be peeling off the old stickers and attaching the new. 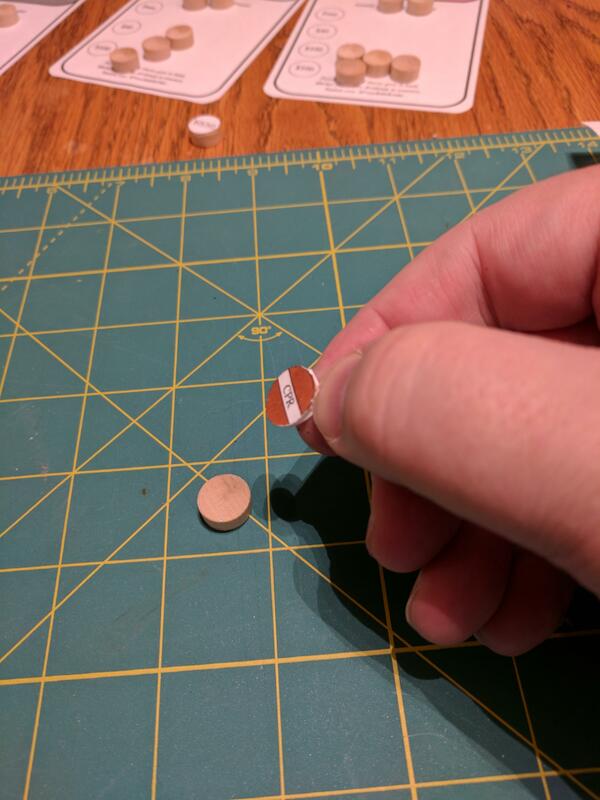 Showing how easy it is to peel the sticker off an old token using a thin-bladed knife. See the little flap sticking out one side of the punched token? Almost every time that will be there due to the different behaviour of the backing paper to the main paper of the label in the punch. The little tab is the backing material and is an easy handle to grab with a fingernail to peel off the rest of the backing. You may note that there’s some shading, that the left edge of each map segment is darker than the right edge. That is a previously unknown behaviour of my printer – I’m pretty sure it didn’t used to do that! 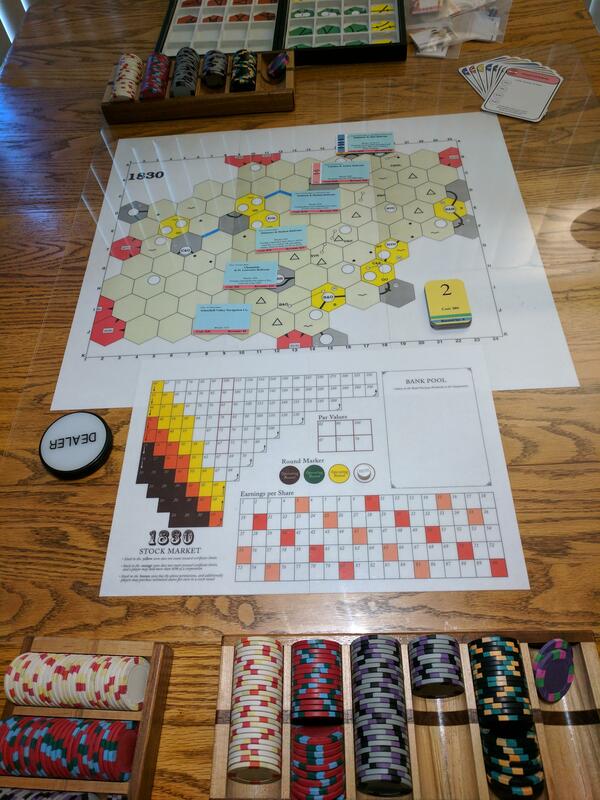 As correctly noted by Stephe Thomas, ps18xx needs a few additional tweaks for the above, most notably to support alternative paper sizes (I think I used A1 for the 1830 map? Might have been A2 – play ith it) and to adjust the layout for track tiles to fit correctly on US Letter paper. I’ve made a GitHub repository with the requisite changes and sent them to Stephe Thomas as well. Homefully the changes will make it into his master.